1. On Tuesday, we said goodbye to our old baby backpack. We sold it to a lady on the Finland equivalent of craigslist. She is going to use it to take her granddaughter on hikes. We have so many good memories of that backpack, most particularly the summer of 2014 when we used it every day hiking in Germany. Goodbye, backpack! 2 and 3. We will (hopefully) soon say goodbye to the girls' old bikes, since they are listed on the Finland equivalent of craigslist. We brought this bike all the way from Sharjah and so there are a lot of memories wrapped up in it. Miriam was riding it around the neighborhood the day after we bought it in 2013 and she got hit by a maintenance golf cart thing. She was a bit bruised and shaken up, and we had to replace the bike's handlebars and front fork, which were all bent out of shape. But she eventually regained her confidence in bike riding, rode the bike for a couple more years, then passed it on to Magdalena to use in Finland, which she did. We bought this bike two days after Jeremy and the kids arrived in Finland. We didn't have a car the first year we lived here, so we needed a bike for Miriam as soon as possible. New bikes are quite expensive here, and we saw this exact model at a bike shop selling for 400 euros, which was a bit steep for a family in the middle of a big move. 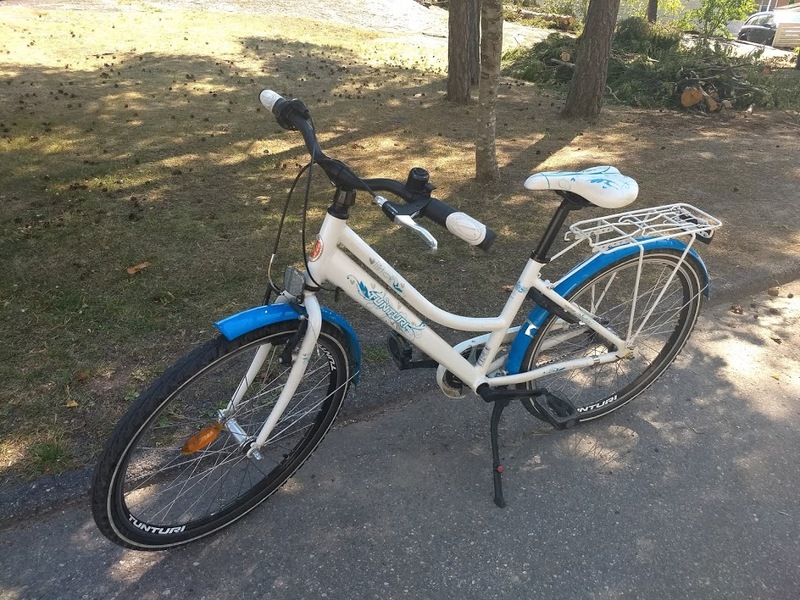 Later that same day, I checked The Finland Equivalent of Craigslist (OK IT's CALLED TORI.FI) and there was this bike, used, but like new, selling for 200 euros. The seller lived out in a small village and obviously it was my responsibility to come pick it up, but when he found out we'd just moved here and didn't have a car, he insisted on bringing it into Turku. We met, interestingly enough, in the parking lot of the bike shop. It was the perfect bike for Miriam's first three years in Finland. 4. My parents have been visiting us for the past three weeks. Yesterday, I took them to the airport and said goodbye. This is one of my least favorite things to do, and I was lucky this year that the blow was softened by the fact that also at the airport yesterday, I picked up my niece for a week-long visit! I recommend this strategy wholeheartedly: when dropping off visitors, just pick up some new ones while you're out! Feb 16 Have fun, or else!